KANSAS CITY, Mo. ¬¬¬— Hereford exhibitors were honored for showcasing their breeding programs at national and regional shows throughout the past year during the National Hereford Show at the American Royal in Kansas City, Mo., Nov 1. 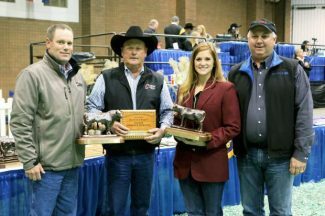 Awards for champion Hereford show heifer, show bull and premier breeder were presented to exhibitors in each of four U.S. regions. To qualify for these prestigious bronzes, exhibitors must have accumulated points and shown at one national and one regional event. Points were calculated throughout the 2014-2015 show season, which ran from the beginning of May 2014 to the end of April 2015. The following are the winners for each of the four regions. Horned Show Bull of the Year – GKB Cattle Co., Waxahachie, Texas, and Brumley Farms, Orovada, Nev., with GKB 88X Laramie B293. Horned Show Heifer of the Year – Rylee Barber, Channing, Texas, with KLD BR Chloe D130. Polled Show Bull of the Year – GKB Cattle Co.; Prairie Rose Cattle Co., Sherman, Ill.; and Eleanor James, Sherman, Ill., with CHAC Mason 2214. Polled Show Heifer of the Year – Rylee Barber with BR Anastasia 3203 ET. Horned Show Bull of the Year – River Circle Farm, Hartsville, Tenn., with RC Bohlin 307 ET. Horned Show Heifer of the Year – John Thomas Woolfolk, Jackson, Tenn., with WF 955W Dominette T137; and Michael Banner, College Grove, Tenn., with JCS MISS 88X 3481. Polled Show Bull of the Year – Doug Le Tourneau, Gallatin, Tenn., with DLL Nick of Time. Polled Show Heifer of the Year – Amanda Bacon, Siloam Springs, Ark., with Bacon Lady Sapphire 1312; and Doug Le Tourneau with DLL Hometown Gal. Horned Show Bull of the Year – Hoffman Herefords, Thedford, Neb., with KF Blue Chip 7Z. Horned Show Heifer of the Year – Kristin Fawcett, Ree Heights, S.D., with JCS Tater Tot 3560. Polled Show Bull of the Year – Colyer Herefords, Bruneau, Idaho, and Elm Tree Farms, Paris, Ky., with C ETF Wildcat 4248 ET. Polled Show Heifer of the Year – Brooke Jensen, Courtland, Kan., with SULL Olivias Time. Horned Show Bull of the Year – Lauren McMillan, Tiskilwa, Ill., with ROF Time is Money 311A ET. Horned Show Heifer of the Year – Madelyn Grimmel, Jarrettsville, Md., with LCC TG Merry Feeling 3158 ET. Polled Show Bull of the Year – Lowderman Cattle Co., Macomb, Ill., with LCC High Stakes 410. Polled Show Heifer of the Year – Kyle Lemmon, Manchester, Md., with KLD BR 7010 Rose D32 ET. Polled Premier Exhibitor – Lowderman Cattle Co.